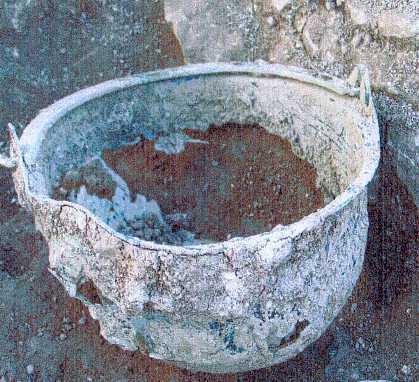 The BHAS Field Unit returned to Rocky Clump in November and December of 2008, after the conclusion of the Arlington excavations. A new area north of the existing 'bone' trench was opened up. The bones trench is notable for the dramatic drop in the natural chalk level. The chalk generally maintains about a 60 centimetre depth over the whole site. 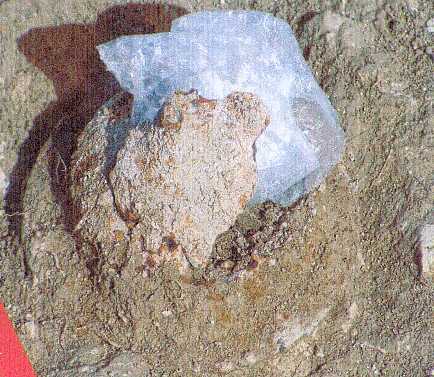 The section in the bones trench show that the natural chalk drops to over a metre or more in depth, and it is possible that this is an area excavated in Roman times. The sections in the south facing baulk show at least 7 and possibly more distinct and subtle layers, with a dramatic layer of deposits in the lower depths. 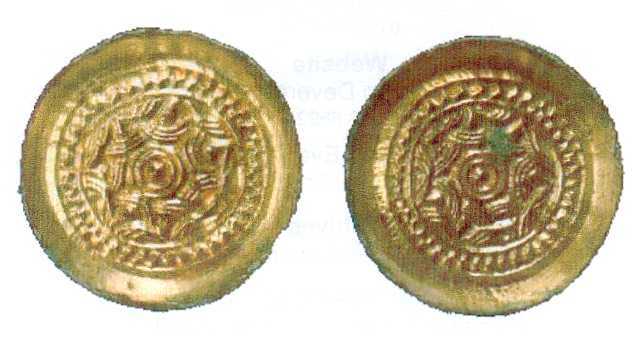 The end of the 2008 season produced some more Roman coins, possible 3rd century Claudian from the upper layers and a very rare brooch of possible Rhine Danubian origin. Only a few have been found in this country in Lincolnshire, Richborough and Colchester. (Pers. Comm. Laura Burnett the County FLO). Rocky Clump still has the ability to record some nationally interesting finds. Well done to Brenda Collins and Mark Gillingham who found both the brooch and coins. The team will be returning to Rocky Clump in the early spring. 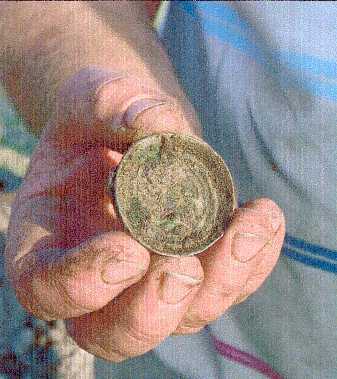 In October 2008 metal detector enthusiasts Bob White and Cliff Smith uncovered the find of a lifetime on farmland close to Lewes. Their detectors signalled items that were to reveal a Saxon cemetery that had lain undiscovered for 1500 years. However, there was also the possibility that it was a much more recent grave. "It was a bit scary at first because we were unsure if it was a murder scene," says Bob. As members of the Eastbourne District Metal Detecting Club, Bob and Cliff -knew exactly what to do and within hours all of the key players had been alerted. 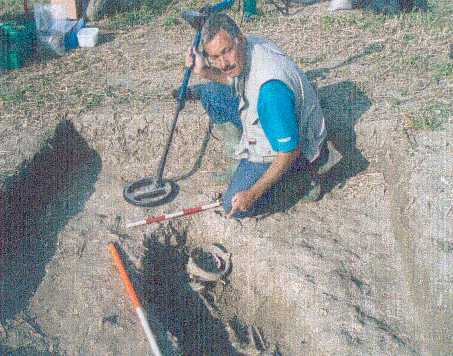 The Police were on site with Casper Johnson and Greg Chuter, East Sussex County Archaeologists who sought advice from Laura Burnett, PAS (Portable Antiquities Scheme) Finds Liaison Officer. Casper and assistant Greg Chuter's main day to day role is giving planning advice and maintaining a record the historic environment of East Sussex and Brighton & Hove. These records are critical in giving the correct advice regarding any works impacting on archaeological remains. 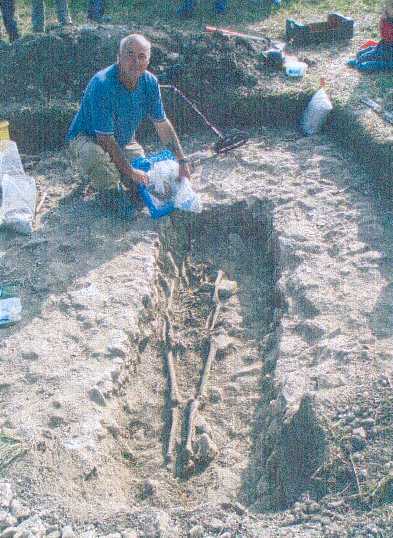 They were able to establish that the remains were likely to be Saxon burials and, to avoid the risk of looting, they decided to excavate the graves immediately, with the permission of the landowner and farmer. 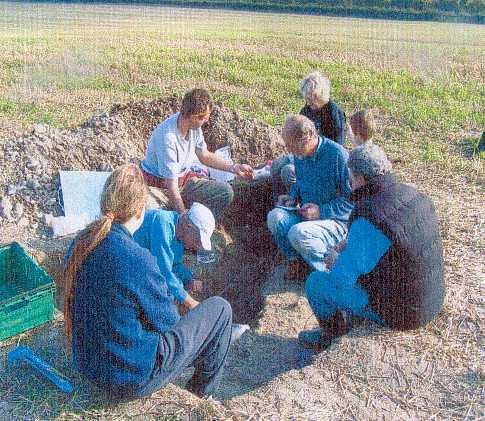 By the next morning Greg had assembled a team of Brighton and Hove Archaeological Society volunteers. They were joined by Bob and Cliff's metal detecting club colleagues to scan the remainder of the field and begin excavation of the graves. Paul Roberts, English Heritage Inspector of Ancient Monuments said: "Anglo-Saxon burial grounds are one of our principal sources of evidence about early Anglo-Saxon people and their way of life. The site near Lewes has been protected as a scheduled monument in recognition of its importance and to help preserve it in future. "Our understanding of the graves is considerably better for the careful and exemplary approach taken by the two local metal-detectorists who discovered the site and its subsequent excavation by County Council staff and unpaid local archaeologists. English Heritage is delighted to be able to contribute by conserving artifacts from the graves at our laboratory in Portsmouth." "Our archaeological section is working hard to make sure that the archaeology in East Sussex is understood and cared for." 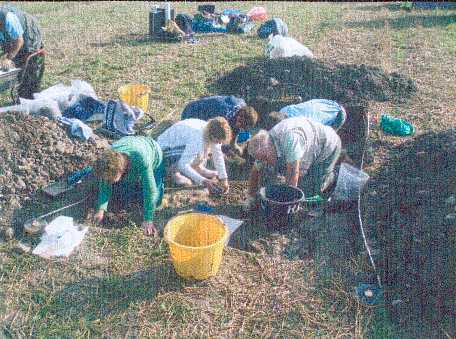 "To do this effectively they need the help of keen people like Bob and Cliff who not only behaved very responsibly by reporting their marvelous discovery, but were of great help in assisting our archaeologists and guarding the site whilst it was being excavated." "Mine and Cliffs names will go down in the history books. To find the unknown is reward enough. That's priceless." 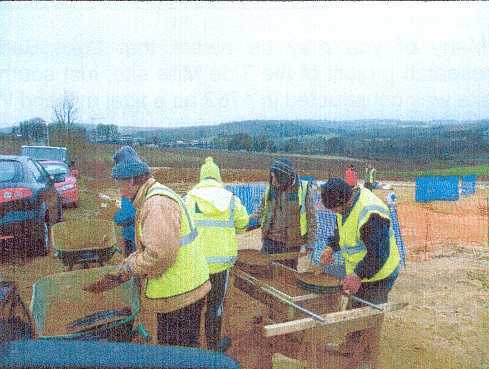 During the four weeks immediately prior to Christmas, some members of BHAS assisted Archaeology South East during their excavations at the site of Brighton & Hove Albion's new stadium at Falmer. bladelet fragments as well as scrapers, cores and other flintwork, much of it Mesolithic. Whilst our role was primarily to assist with the sieving, we did spend some days helping to excavate some of the many features, including post holes and ring ditches. The area excavated was in the north east corner of the site where the features were cut into the sand. The sand was several metres deep and presumably originally formed part of the site of a prehistoric beach. Hopefully, we will have another opportunity to assist Archaeology South East in the not too distant future.